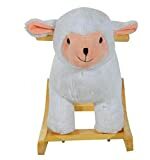 Rocking sheep is a great toy for your child, it has the ability for your child to sit on and stay in control by the means of holding the pegs behind the ears and securing your feet on the footrests. Made from a metal structure and wooden base for stability and is covered with a plush material. Your child can be comfortable and it is a fun toy for your child to enjoy.